An Instant domain search allows everybody to check the availability of a domain instantly. This can help in the decision making process of choosing the name of your personal or business website. This is a fast, handy tool that will save your time and frustration. Have you ever wondered about the availability of certain web addresses? Perhaps you have always wanted to use your own name as your website name, or the name of a friend or relative. 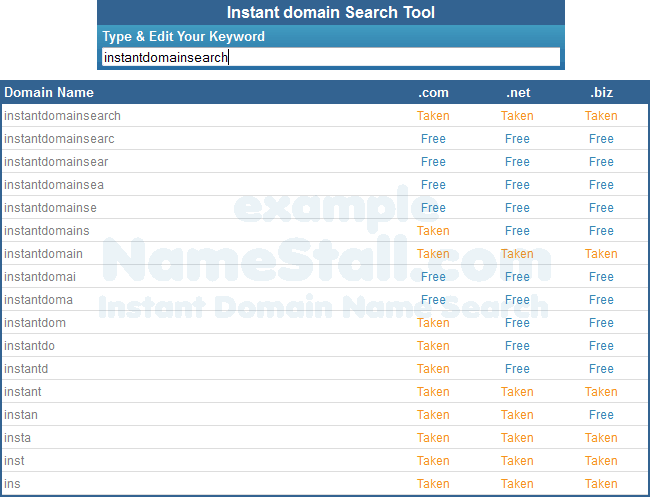 Rather than manually checking for each idea, a tool like this will tell you instantly and automatically if you can use your desired domain or part of it. Our instant search engine will show you domain availability as you are typing, so each time you add a letter or character or delete a letter or character; it will be checking a different name. The tool is also handy because it checks for TLDs like .com, .net and .biz at once. It allows you comprehensive searching and increases the chances that you find a wonderful website name you are satisfied with. If you think about how much time this would require with manual entry into the address bar, you will see just how helpful a script like this can be. Lots of people know instant domain search script as ajax domain search tool. Actually there is little difference between instant checker and ajax checker. What follows is some clarification and directions on how to use our instant searching engine. You may have an idea or a specific set of ideas that you want to check for. You can create your own keyword rich domains using this amazing search engine. For instance, let�s pretend you have a shoe business in Boston, Massachusetts. Your desired name may be Bostonshoe.com. Well, you can begin typing and the instant finder will list the availability. Once you have typed in your desired idea fully, you will see if this will be an option for you. If it is not, you can then check modified names like BostonShoes or BostonShoeSell or BostonShoesBuyer etc. Even you can make your own brand able company names using our fast domain search engine as it is always a great tool for brainstorming company names. For example you want creative & cool company names your shoe company in Boston, just type shoei or shoein or shoeing or shoeings etc. Every time you insert a (new) letter or character to your keyword our instant domain finder will check availability of that name right away for three different TLDs increasing your chance of success. Not only will this save time, but it can sometime create your generic domains by giving great domain suggestions. You may find that you like a suggestion even more than one of your own creation. Therefore, our instant lookup can quickly and thoroughly show you your best options. In just moments you will know if your preferred domain is available or if not you can explore who is the owner and when it will get expired using our whois lookup. In the end, you will have the advantage of the instant checker doing all the works for you. Even you don�t need to be concerned if you are not an expert domainer or cannot make or choose any name of your own innovation. Our website has all kinds of naming solutions for everybody. Just try our domain name generator and brand name generator. Those two tools along with bulk domain search or top paying keywords domain search tool will defiantly help you find a perfect and suitable domain for your company or website or blog.